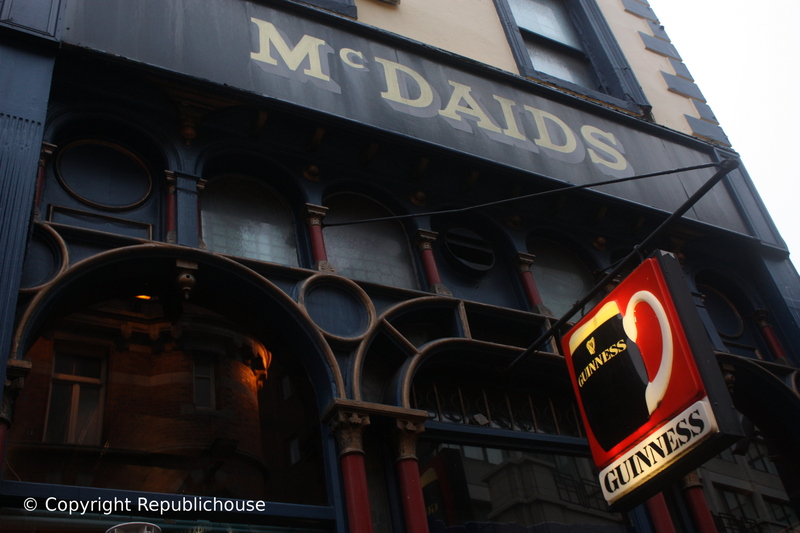 Even though McDaid’s has prime of place in Dublin’s city centre – just off Grafton Street, the city’s showcase shopping boulevard – it still feels like a trade secret when you slip into it for a sneaky late afternoon pint. This is how McDaid’s is best enjoyed; on the off-chance, ‘on the Q.T.’, with a drinking buddy, or without one, for a pint and a few moments of peace but most importantly, when it is not jam-packed, which it regularly is on weekend nights or during a big match. During these off-peak moments, the pub’s cavernous charm, smaller crowds and view to the street through its huge windows make it the perfect place to momentarily step out of the hustle-n-bustle of modern life and to watch the world go by. It’s not a pub you’ll see emblazoned on posters or postcards in nearby tourist shops, but it is surely the equal of many of Ireland’s other famous traditional pubs. For those in the know, McDaid’s is an old friend, there when you need it. For newcomers, stumbling in from the city’s main shopping and tourist sights, it is simply a great find. Carved from the remnants of an old chapel once used by the Moravian Brethren around the late 18th century, the high-ceiling front bar is therefore ecclesiastical in style, as hinted at by the tall, gothic-style windows topped off with ornate stained glass. As if that religious heritage wasn’t unusual enough, previous to this the building once housed the City Morgue, which is quite something to bear in mind over an ordinary afternoon pint! McDaid’s had several owners since its establishment in 1873 and was known as William Daly’s bar before John McDaid purchased the pub in 1936. It was from this point that McDaid’s began to attract journalists and noted writers although it still largely had a plain, dreary interior with a mainly working class clientele. The mixture of writers and workers began to give the pub its unique vibe as did the gradual redecoration of the pub over time, to include the variety of adornments you see around the place nowadays. Old-style tiling runs along both sides of the bar, crowned with pictures of bygone days & bygone heroes including trams on O’Connell Street, Toner’s pub in its hey-dey, and portraits of Irish literary legends. Antique mirrors, library books and old whiskey bottle boxes also compete for wall space. Used suitcases, bronze mixing tanks and a giant, old radio sit perched high above the main bar. The downstairs bar is small but perfectly formed; essentially one large open room with the bar counter on the right as you walk in and stools lined along the walls to be dragged wherever as need be. Originally the bar counter was situated on the left side of the room, but was moved in the early 1980’s to where it sits now, as I was delighted to overhear in a conversation the barman was having with some tourists. There is a small seated area to the rear for those weary-legged from shopping or starry-eyed from romance and in need of an intimate corner. The tiled centrepiece behind the bar counter notes McDaids was established in 1873. On both sides of this centrepiece, a fine selection of Irish and Scottish whiskies sit lined on glass shelves ready to satisfy the discerning palette. 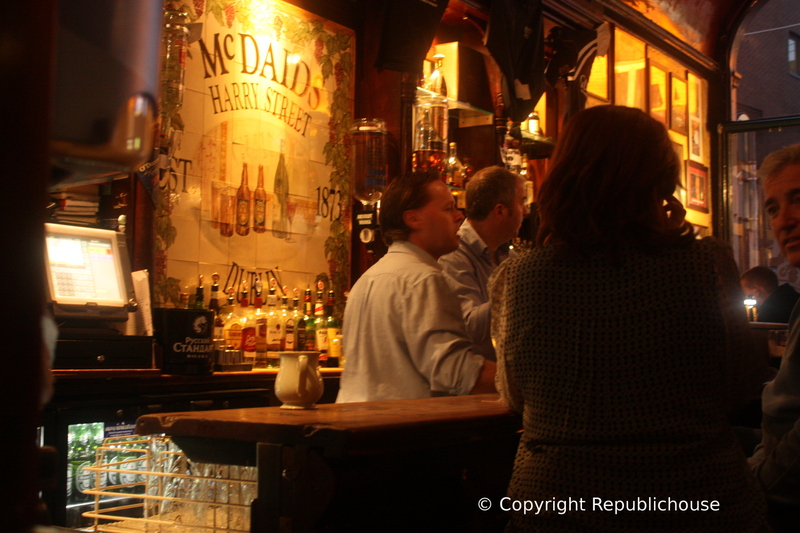 McDaid’s is certainly a pub that you could confidently point whiskey connoisseurs towards knowing they won’t be short on choice, not unlike Tigh Neachtains pub in Galway City. McDaid’s has a few other tricks up its sleeve too. There’s a beer terrace out front where you can keep an eye on eager shoppers or indeed other socialites across the street at the outdoor terrace area of Bruxelles bar (which deserves an honourable mention, as it’s well worth a visit too!). There’s also an upstairs bar in McDaid’s which is available as a function room that you can reserve for company parties, landmark birthdays or other such events, plus it acts as an overflow area on busy weekend nights. Top tip – if you are intent on visiting on a Friday or Saturday night, then head straight for the side door entrance and zip directly up to the less manic upstairs bar! It’ll more than likely simply be too packed downstairs. As the crowd slowly brewed in the hours following 5pm on this particular weekday, the atmosphere was cosy and jovial. Likewise, when Angelika and I returned with our friends, Marie and Gabriel, on the following Sunday afternoon, there was a relaxed vibe amid the banter of the small crowd. You can judge how special McDaid’s is by just looking around you and noting the amount of smiles about the place. There’s the regular visitor; content, reading their daily newspaper over a crisp pint of Guinness; there’s the group of corporate types over for a few days’ work not knowing their luck to have stumbled into such a genuine Irish pub; there’s the elderly couple in from the nearby salubrious Westbury Hotel indulging in a pint of plain at a real Dublin boozer, contrasting with the measured excellence of one of Dublin’s finest hotels. 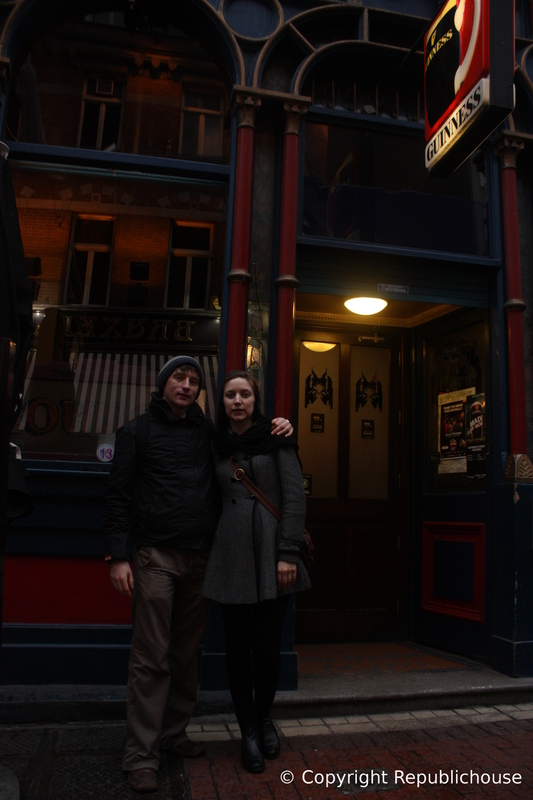 This pub is the real deal and has been since the late 19th century but particularly since the early 1940’s. The only notable concession to modernity is the television perched high above the front door porch, but again, even that is discretely tucked away within the sacred walls of this fine, old pub. A pint of lager will set you back €5.60, or a Guinness €5.10, which is the going rate around these parts. 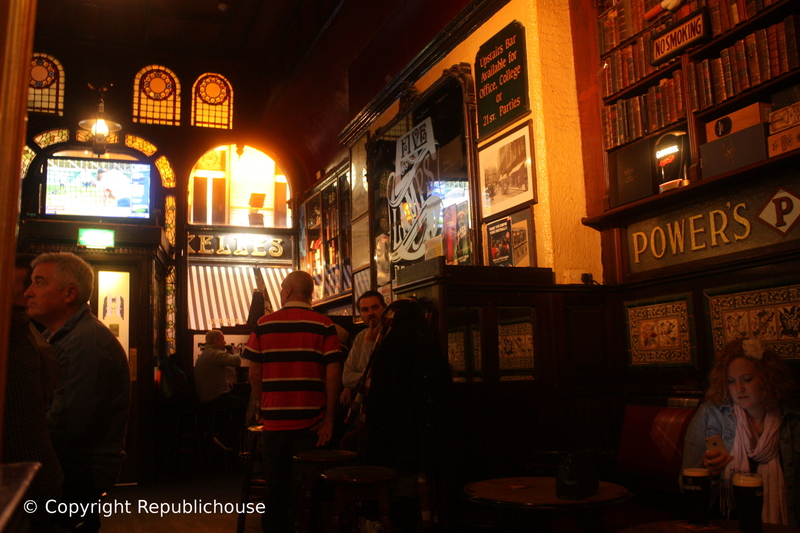 For those on the literary trail in Dublin, McDaid’s is a must-see. Many literary greats have been regulars here over the years, most notably Brendan Behan; poet, short-story writer, novelist and playwright, who wrote in Irish and English. 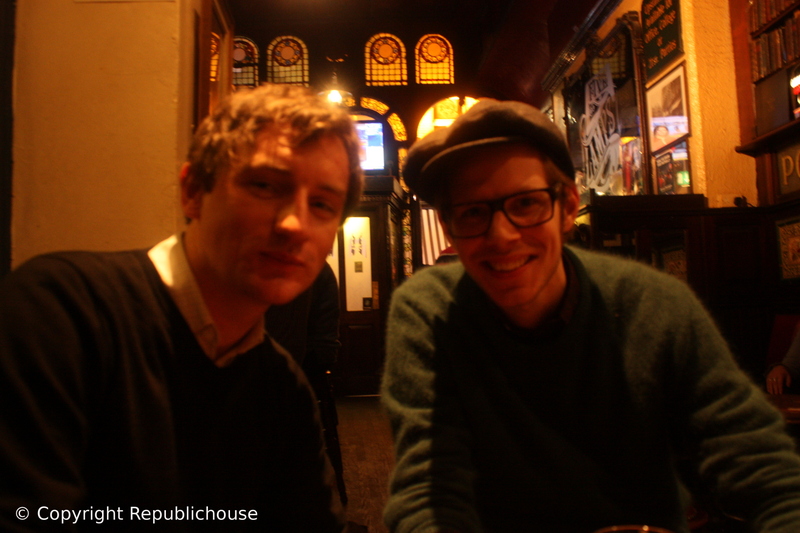 From the 1940’s all the way through to the late 1960’s the pub truly established its literary reputation, with Behan a regular visitor, along with Patrick Kavanagh, Liam O’Flaherty, Brian O’Nolan, Austin Clarke, Flann O’Brien, Anthony Cronin and J.P. Donleavy. Behan is known to have based some of his characters in ‘The Hostage’ and ‘Borstal Boy’ on characters he encountered in McDaid’s. Likewise, Donleavy’s main character in ‘The Ginger Man’ was apparently based on McDaid’s regular, Ganor Christ. 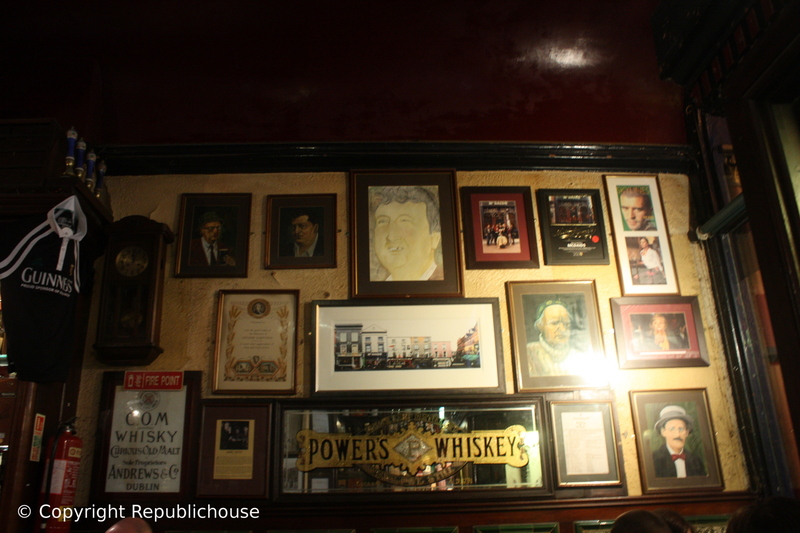 Portraits of many of these literary legends adorn the walls to this day and the staff there are as knowledgeable in telling stories of these famous past patrons as they are in serving up the finest editions of pints of Guinness. They are a friendly bunch too. So if you want to experience a slice of Dublin pub heritage that has inspired many a famous literary soul whilst quenching your thirst away from the busy streets, slink on into McDaid’s of an afternoon. Maybe you’ll get inspired to write a few words yourself. There’s some tough competition to get your portrait on those walls though mind you. Visit because: Step into a shrine to literary inspiration (it’s Brendan Behan’s old ‘local’), where there’s a chapel-like feel, offering an oasis of calm from Dublin’s busy city centre. The Guinness is second-to-none and the staff are good for a chat too when it’s not too busy. As ever, well worth it for a delightful, brief evening visit!